We’ve done a larger on street version of this before but someone asked about the possibility of a canvas version and I jumped in and cut the stencil but the deal then didn’t progress. I came across the stencil again whilst having a tidy up and had a canvas handy so thought I may as well complete it. Since living in Brixton I’ve become enamoured with the phrase ‘Whagwan’. For the uninitiated, the phrase means ‘what’s going on’ in Jamaican Patois. The spelling can vary but the meaning doesn’t change. 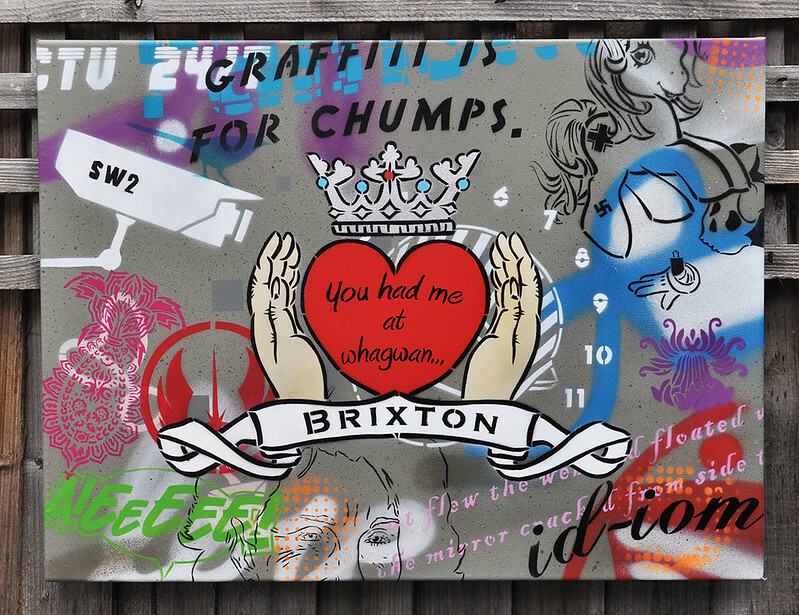 Anyway, once I’d combined that with a nice little romantic statement and a bit of traditional Claddagh ring design, hey presto, I had this little declaration of love for Brixton. Then it was just a matter of adding it to the messy ‘graffiti wall’ style background and, by jingo, you’ve got it!